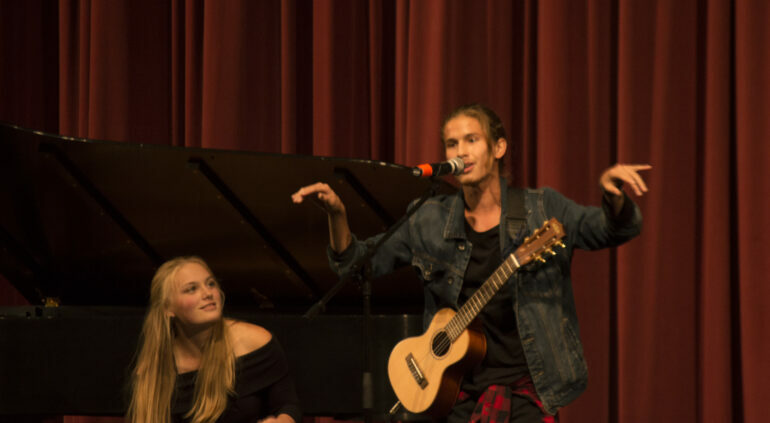 The 103rd Dakota Days celebrations kicked off with the annual Yotes Got Talent show and the top 14 reveal of the candidates for Dakota Days royalty in Slagle Hall Sunday. Yotes Got Talent performers included singers, a violinist and USD’s acapella group, the High Howlers. Senior Marissa Reis said her favorite part of the night was seeing students with such great talents. Senior Meredith Jenkins performed with the High Howlers and had a solo. The night also included the top 14 reveal of Dakota Days royalty. Senior Keri Kamphoff said she was excited and honored to be chosen as one of the top 14 candidates. Kamphoff said the top 14 will now have to go through an interview process and write papers explaining what it would mean to them to be Mr. or Ms. Dakota. They’ll be in the parade on Saturday, and the winners will be announced during half-time of the football game. Reis said she thought everyone who made the top 14 for royalty deserved it. “I honestly thought that everyone who got it was a really good candidate,” Reis said. Kamphoff said she’s looking forward to seeing everyone’s school spirit during the remainder of Dakota Days.